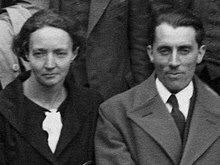 Irène Joliot-Curie (12 September 1897 – 17 March 1956) je onimo sayensi ara Fransi, ohun ni omobinrin Marie Skłodowska-Curie ati Pierre Curie ati iyawo Frédéric Joliot-Curie. Lokanna mo oko re, Joliot-Curie gba Ebun Nobel fun Kemistri ni 1935 fun iwari won iranna afowose. Eyi so ebi Curie di ebi to ni awon elebun Nobel julo titi doni. Bakanna awon omo mejeji awon Joliot-Curies, Hélène ati Pierre na je onimo sayensi pataki. ↑ Byers, Nina; Williams, Gary A. (2006). "Hélène Langevin-Joliot and Pierre Radvanyi". Out of the Shadows: Contributions of Twentieth-Century Women to Physics. Cambridge, UK: Cambridge University Press. ISBN 0521821975. Àtunṣe ojúewé yi gbẹ̀yìn wáyé ni ọjọ́ 4 Oṣù Kẹta 2015, ni ago 16:17.